Want a UML diagram maker to replace Visio with lower cost but more powerful features? Here is the ideal solution. Edraw is a popular Visio alternative for making uml diagram and other drawings on both Mac and Windows systems. Although there are plenty of Visio alike products for UML diagrams, it's difficult to find a Visio alternative for Mac. To benefit Mac users, Edraw has newly released a Mac version allowing users to create uml diagram easily on Mac OS X system. It requires one-off payment instead of monthly or yearly fee while offers abundant free templates and examples. Edraw is a vector based UML Diagram creator having similar features with Visio that helps easily design uml diagram with ready-made symbols and templates. The Microsoft-like interface makes it quickly to get accustomed. Besides, there are much more uml symbols and templates than Visio, which will help you develop any UML diagram with no hassles. By using this Visio like tool, users can develop professional uml diagram in a way faster than you think. Compare with Visio and many other diagramming tools, Edraw is a better choice for an array of benefits as follows. Use-case diagram, class diagram, activity diagram and sequence diagram. Flowchart, organizational chart, mind map and over 20 kinds of diagrams. A cheap Visio alternative that is much pore powerful than Visio. User-friendly interface similar with Word, without learning curve. Pre-made symbols that support drag-and-drop use. Pre-installed templates for instant start. A lightweight desktop app of flexible launch. Supports direct links between pages. Nice drawing with automatic grid snap. Zoom in/out while keeping high resolution. 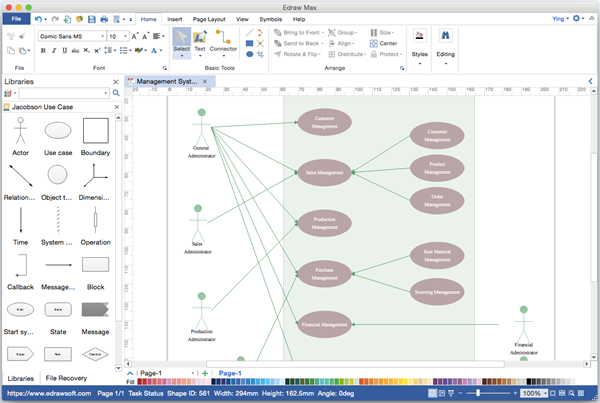 Multiple diagram elements select and flexible Lasso Select Tool. Limitless drawing space with auto expansion. 1-click change of style through themes. Export diagrams to various formats such as graphics and MS documents. UML Diagram can be easily created on Mac using Edraw. You can free download the trial version to see its powerful functions first. You will discover many practical uml diagram templates in the software, together with useful tutorial materials that help develop a perfect uml diagram smoothly. Start Edraw, open a uml diagram drawing type. The corresponding uml diagram symbols library will open automatically on the left, which contains the most common shapes for this certain uml diagram. Drag useful shapes and drop onto the canvas to start drawing. Connect shapes and style the shapes as you like. Lay out your uml diagram by using grid lines and quick Align and Distribute buttons. Apply a theme for professional quality result. When a uml diagram is done, many export options give you various choices to share your work in other formats. As an all-in-one Visio-like diagramming tool, it's not only capable for UML diagram, but also for floor plan, flowchart, electrical diagram, infographics, wireframe, science illustration, timeline, etc. Discover why Edraw is the best software to create UML diagram. Try Mac UML Diagram Software FREE.